Looking for some rehabilitation to recover from the hustle and bustle and escape to an inviting adventure? Rehab Bingo will fill that need instantly and take you away to a bingo community of players’ goodwill and winners. Improving people’s lives less fortunate is what Rehab Bingo is all about. It is the UK & Ireland’s charity bingo site that is instrumental in helping those with disabilities. In Ireland it is by far the largest charity catering to the needs of those socially marginalized. Established in 2005, the site has built an honorable reputation and players from the UK and Ireland are eagerly flocking. The non-governmental organization works in local communities and each year helps some 50,000 people with disabilities. It is the bingo site that even when a bingo player loses, they are still a winner for benefiting a good cause. The web design showcases a pale blue sky with scattered fluffy clouds in an atmosphere that offers not only hope but a chance for fantastic wins and where the sky is the limit. Powered by Virtue Fusion, players are assured of quality bingo and superlative games. Rehab Bingo is regulated and licensed in Alderney. There is an exceptional line up of Bingo fit for every type of player. There are 12 bingo rooms offering 90 ball, 80 ball and 75 ball bingo variations. Bingo games have plenty of Jackpots with the bingo rooms with side games to keep the bingo player actively entertained. The Mary Byrne room is full excitement with bargain bingo and multi variant games to add a bit of spice to your play time. A complete schedule highlighting the daily bingo events is available with an option to pre-buy tickets in advance. Bingo specials showcased include BOGOF, Lunchtime specials, Deal or No Deal and Fair for All games. For the bingo player wanting a bit of variety to their wagering there is an entire list of other games to delight in. Slots are reasonable with 1p wagering with some of the most popular gaming in the business. Multi-player Slot allows players to interact while spinning on Multi-Balls, Clover Countdown and Marine Mayhem. Scratch Cards and Casino Games complete the entourage of amazing games. Players can expect a Deposit Bonus straight away after registration. The promotions are broken down into three categories: Daily, Featured Promos and exclusive promotions. The Daily promotions offer Guaranteed Jackpots, Big Pots and Budget Buster Games. Every day of the week offers something special for players. 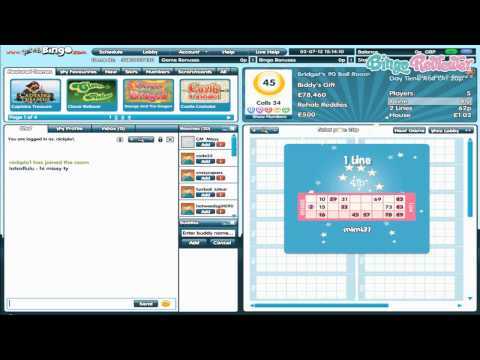 Fair For All Pots allows players to have the same amount of bingo cards for an equal chance to win. Play Bingo for Free where real cash prizes are up for grabs. Players have the choice to “super up” the prize. The games are available for 90 ball bingo where every other game is absolutely Free. Rehab Bingo has a lovely loyalty program where players will have lucrative benefits including Weekly Cash Back, Weekly Free Bingo Party and so much more. Thanks for the review. I checked it out and its a good feeling to know at least if i lose it goes to some well deserved charities. They really give away a lot of cash at this site! We’re talking over €1,000,000 in prizes every month! They offer traditional 75 and 90 Ball Bingo and there are 11 awesome Bingo rooms to choose from. If you like to be ahead of the game, you can pre-buy all your tickets so you can be on your way toward winning exciting jackpots sooner. They also have a unique selection of slots here, sure to please any taste. Take your pick from a wide range of options like Rocky, Iron Man, Zodiac Supernova and Lucky Ladies 88. Multiplayer slots, scratch cards and table games are included in their collection as well. You can catch a game of Free Bingo daily at this site. Simply head to the landing page, click on “Bingo” and then on “Schedule” for a complete list of when you can delight in such Freebies. Look out for other promotions running daily, weekly and monthly as well, including Bargain Bingo, BOGOF and more. With twelve bingo rooms available for players at Rehab Bingo, you can't go wrong. Even if you lose, your funds didn't exactly go to waste as this site contributes to the benefit of those less fortunate. So if your game isn't going as well as you would like there's still a good feeling to be had that you are helping out with charity for the disabled. The large variety of bingo games is complemented by the other games available for play at Rehab Bingo. Slots, scratch cards and casino games are also readily available to you and of course you can participate in many jackpot games and team games as well. Be sure to look out for the deposit bonuses for when you are ready to fund your account and get some serious game time in. And don't forget about the free bingo games that are running as well as the BOGOF games. You should have lots of fun playing here and also you should feel good that part of your money goes to help those in need. Have fun and win a lot here at Rehab Bingo. A great place for UK and Irish players, with some of the biggest prizes that I have ever seen in any of the casinos I have played. There are nine rooms opened at the moment (New York, Girl's Night Out, The Bingo Games, Champagne and Chocolate, Beverly Hills, Deal or No Deal Bingo 75, Rodeo Drive, Lucky numbers and Deal or No Deal Bingo 90). All in all, the regular 75 and 90 ball games plus popular 80 ball variant. Not really sure how the name Rehab really plays well for a Bingo site, but they seem to have a nice community and always a good number of players active. You can check the schedule in order not to miss a game, and pre buying tickets will book you a place. On your first £10 deposit, you will get a £20 free, and to be honest, I expected a bit better offer for the starting promotion. There is a 3x WR for the bonus, eligible only for Bingo games.